In the name of God the Father, God the Son and God the Holy Spirit, Amen. This powerful assignment from Jesus is the theme of our 2015 Synod, and yet, it is something much more significant than our theme. Our Lord’s commission to be the light of the world is being embraced by congregations, lay people and clergy across the Missionary Diocese of CANA East from Maine to Miami and from Tulsa Oklahoma to Virginia Beach. Be the light of the world, in order that others may see your good works and give glory to your Father who is in heaven. [I will return to our Synod scripture before I conclude this pastoral address). It is both an incredible privilege and honor for me to welcome The Most Rev. Dr. Benjamin Kwashi, the Bishop of Jos and the Archbishop of Jos Province, Church of Nigeria (Anglican Communion). The Anglican Province of Jos has been subjected to numerous horrific outbreaks of religious violence and acts of terrorism. Many thousands of Christians have been killed and numerous churches and associated buildings have been destroyed. In 1987, Archbishops Kwashi’s church and vicarage were totally burned down in Christian- Muslim riots. He has survived three attempts on his life and speaks first hand of Almighty God’s grace and power experienced in the most difficult of situations. Courage has come at a personal price for Archbishop Kwashi who has been personally targeted by Islamic extremists. His beautiful wife Gloria was badly beaten by Islamic extremists and dragged through the streets to the diocesan offices. She was left blind until surgery in Texas restored her sight. Almost 18 months later, as the family prepared to celebrate Gloria’s recovery, four young men arrived to kill Archbishop Kwashi, however the Lord rescued him and his family. Archbishop Ben and his wife Gloria have six children. I have been a guest in their Jos home and privileged to minister in their diocese. 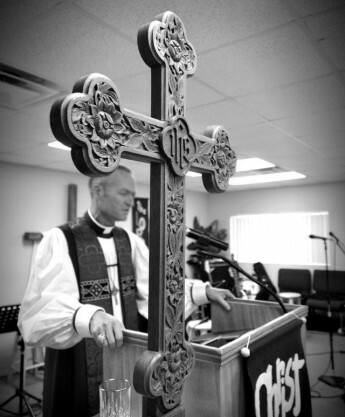 As the Anglican Church across the United States and Canada became increasingly unhinged from its biblical and historical theological moorings, God spoke to Archbishop Benjamin Kwashi about a vision for a new work, a new biblical mission where Anglicans would be ‘light to the world’ declaring and defending the gospel once for all entrusted to the saints. Archbishop Kwashi’s vision would become in time the Convocation of Anglicans in North America. Your Grace, The Missionary Diocese of CANA East exists today, in part, because of your vision for Anglican mission and ministry in North America. Thank you, Sir, for being a catalyst used by the Living God to establish the ministries represented in this gathering today. Your Grace, on behalf of the delegates of the third Synod of the Missionary Diocese of CANA East, I welcome you among us. Brenda and I are honored to call you and Mama Gloria our friends. You are a modern day hero of the faith and one of the most courageous Christian leaders of our generation. Thank you for responding to my invitation to gather together for this Synod of our Missionary Diocese. At our inaugural Synod three years ago, we began life as a diocese with 23 congregations and missions. Today, three years later, 31 congregations and missions call The Missionary Diocese of CANA East their jurisdictional home. We remain one of four dioceses of the Convocation of Anglicans in North America and are full members of both The Anglican Church of North America and The Church of Nigeria (Anglican Communion). During the past year, two beloved members of our clergy family have died. We remember with thanksgiving to God, The Rev. Gilbert Wilkes, III. There are many phrases attributed to Gil (some of them we must not mention in this setting) however, in an essay Gil wrote entitled, Death by Delay / A Failure of Fortitude, he said, “We have a problem, the time for delay and discussion is over, George Patton had good advice for those of us who claim Biblical Orthodoxy, “Lead, follow, or get the hell out of the way!” We also remember the untimely and tragic death of The Rev. Dr. Kent Hinkson, a much loved priest of our diocese and express our condolences, love and prayers to Mrs. Pam Wilkes and Mrs. Jeline Hinkson, their families and congregations. A diocese is a family of Christians and congregations under the oversight of a bishop who voluntarily choose to belong to a synod. Though diverse in their service, the congregations of this diocese hold to a shared confession of the Christian faith as taught in Holy Scripture and the historic formularies of the Anglican Church. When many people think Anglican, they think Westminster Abbey, Lambeth Palace, grand cathedrals and local churches with high steeples and domes designed by such well known architects as Sir Christopher Wren. Sometimes we even make journeys to these Cathedrals of England and Europe, perhaps in an attempt to secure within us our Anglican heritage. And yet, we in CANA East find ourselves in a missionary diocese. Our diocese was inaugurated in a rented chapel in the mountains of Ridgecrest, North Carolina in 2012 and our diocesan headquarters are in a shared facility with another Christian organizations in Virginia. Our pastors and lay leaders are missionaries. Our congregations are centers of missional activity and outreach. Sunday by Sunday the faithful congregations of CANA East are meeting for worship in missional contexts. Holy Cross in Virginia Beach, Virginia meets each Sunday morning in a storefront. St. Thomas’ in Springfield, Missouri meets week by week in the East Richmond Place home of Archdeacon Carl and Janet Eyberg. Redeemer Church in Annapolis, Maryland meets at the Lowes Annapolis Hotel and from time to time in a photographers studio. Church of the Pentecost in Harrisburg, Pennsylvania, a congregation that was inaugurated less than two weeks ago and was officially received as a congregation of the diocese this morning, meets for worship at the Maple Street Fire House, complete with fire trucks and sirens… …[seems a most appropriate location for a church named after the outpouring of God the Holy Spirit on the Day of Pentecost]! Numerous congregations of the diocese meet in rented facilities, some share space with other churches, while others have been able to make the transition to more permanent locations. This reality keeps us anchored in the missional commission from our Lord to be ‘light to the world’. Cathedral steeples, grand organs and elevated pulpits are not wrong, they are tremendous gifts to be used for the glory of God. However, our current expression of Anglicanism is somewhat different. As your bishop, I truly believe that Almighty God has called The Missionary Diocese of CANA East as a biblically reshaped mission seeking to reach North America with the transforming love of God. The Lord of the Church has given us a holy opportunity to re-examine our mission, our ministry, our structures and our national and global relationships, to fully engage in God’s call upon our lives. As a result, the optics of our mission may look different from traditional Anglican structures. The ministry to which Christ has called us, presents us with a considerable challenge. Will we together as Anglicans in this Missionary Diocese, forgetting what is behind and straining forward to what awaits us, embrace the difficult challenge of our Lord, rise up and embrace the opportunities that are before us, or will we be more content to replicate the patterns and structures of our former days? It was not long after their deliverance from the Egyptian oppressors that the children of Israel began to whine and complain about their circumstances. “We remember the fish we ate in Egypt that cost nothing, the cucumbers, the melons, the leeks, the onions, and the garlic. But now our strength is dried up, and there is nothing at all but this manna to look at.” I want to prayerfully and carefully remind us as a Missionary Diocese that we must not be complacent or overwhelmed and reinvent the less effective structures of the past. We remember the buildings, the trust fund money from dead people, the financial resources and legacies of the diocese, the choir vestments and the silver chalices donated by founding church families. We remember full time clergy salaries, annual stipend increases, retirement funds, renovated rectories, clergy discretionary funds and Synod’s that were in easy driving distance from our homes. We must be constantly vigilant against an all-too-human temptation to feel that the past was better, easier and so much less stressful. If you are ever tempted to think the past was better, consider the present just for a moment. In the three years since the inauguration of this diocese 14 people have been ordained into holy orders (five more will be ordained at our service tomorrow). Nine new Anglican churches have been planted (including our host congregation here in Wayne). St. Andrew’s in Endicott, New York, Church of Transformation in Mays Landing, New Jersey, Good Shepherd in Binghamton, New York, Holy Trinity in Plainville, Connecticut and Holy Trinity in Syracuse, New York all have new buildings of their own, some with no debt at all, some gifts from other congregations, all a result of the incredible provision of the Lord of the Church. If you are ever tempted to think the past was better, consider for a moment the incredible clergy of this diocese. They truly are incredible because they believe the call of God on their lives is a holy calling. This Missionary Diocese has been blessed by God with an extraordinary House of Clergy. Ordained men and women who believe that faithfulness to the gospel is greater than climbing the ecclesiastical ladder, or the increasing status of their 403b retirement plan. Clergy who believe that proclaiming the Word of God and celebrating the sacraments is their highest calling, even if such proclamation is considered unpopular and archaic. Clergy who believe that serving the people entrusted to their pastoral care may even require them to have additional employment, to serve bi-vocationally as pastors and church planters. Archdeacon Patrick Malone, Vicar of Holy Cross Anglican Church in New Berlin, Wisconsin leaves every week day morning at 6am and again at 2pm to drive public school buses so that his family are provided for and the growing congregation has ordained leadership. While leading All Saints’ Anglican Church in Newark, New Jersey and serving as Archdeacon and advisor to the Bishop, the Venerable Dr. Paul Ekezie is employed as a geologist for the City of New York’s Department of Design and Construction. While being the father of a ‘not yet 12 month old’ first child and the Vicar of Christ Church Anglican in Branford, Connecticut, The Rev. Matthew Mahan works 25 hours per seek as a department head for Hobby Lobby, in order to fulfill his calling as the leader of the congregation. Church planter Canon-elect Augustine Unuigbe from Church of Transformation in Mays Landing, New Jersey, father of three, works nights as a medical doctor from 6.00pm to 6.00am, his wife Florence, also a doctor works days from 6.00am to 6.00pm. When Bishop Bena visited two weeks ago they had 30 people in attendance and took an offering of $654 for the diocese. The Venerable Dr. Wayne Buchanan, Rector of St. Brendan’s in Tremont, Maine, Archdeacon of the North East, advisor and international travelling companion to the Bishop drives a 110 mile round trip twice a week to lecture in biblical studies and languages at Grace Evangelical College & Seminary. Consider not only our clergy but also the often unspoken, un-thanked sacrificial service of our clergy spouses. While balancing the very godly calling of motherhood and demands of being married to clergy (most of whom are ‘Type A’ personalities) many clergy spouses in this diocese have secured regular employment to enable their husbands to serve as rectors of our congregations. Thank you clergy and spouses. Thank you on behalf of the Missionary Diocese of CANA East. You have been called to a life of dedicated sacrifice. To leave the palaces behind and follow Almighty God – through desert, swamp, mountains and across the wide rivers. To stand firm against the scoffers and the enemy. Your service is recognized, it is acknowledge and may Almighty God be thanked and praised of each of you. And so, while the last twilight beams of our former jurisdiction might be a nostalgic memory of patterns, structures and financial certainty, consider what God is doing among us today. Today, He is clearly at work building His Church as He said He would, this should encourage and strengthen us in our mission! Last year as we gathered for our second Synod, I emphasized ‘Church Planting’ by asking each of our congregations to very prayerfully and intentionally consider planting one new congregation within the next three years. The Venerable Dr. Paul Ekezie is seriously planning a new church plant out of All Saints’ in Newark, New Jersey. In his retirement, The Rev. Donald Helmandollar is considering planting in Rhode Island. Church of the Pentecost, Church of Transformation, Reformation Anglican Church are all new church plants [and there are other conversations happening about church planting across the diocese]. Over the past year, a number of people have said to me, ‘We are not ready bishop, our current congregation is too small.’ You and your congregation are the best equipped to know when the timing and resources are right to plant, however the ‘too small’ argument is never a winner with me! Brenda and I, our then 18 month old son Samuel, and two additional couples planted Bishopdale Community Anglican Church, which by the grace of God became the fastest growing Anglican congregation in that location at that time. Church planting is an achievable goal for most of our congregations. I strongly encourage and urge you to prayerfully prioritize church planting in your congregational planning this coming year. I also spoke about ‘New Leadership’, recruiting, training and developing new clergy in our diocese. It has been significantly rewarding for me as your bishop to watch many of our congregations embrace this vision. Christ the King Anglican Church in Pine Knot, Kentucky with a membership of 21 individuals is the sending congregation of Lucas Waters, a seminarian from this diocese at Trinity School for Ministry. The Rev. Briane Turley, Rector of Church of The Holy Spirit in Tulsa, Oklahoma has brought 23 year old Seth Whitaker to this Synod, a young man clearly called by Almighty God into His service. The Venerable Alan Crippen II is preparing post graduate Christian leaders for ministry in the public square through his ministry at the John Jay Institute where Roman Catholic students, Baptist students, Quaker Students, Non Denominational Students use they daily office of the 1928 Book of Common prayer in their formation as leaders. Joel and Christy Lafferty are with us at this Synod. A young couple who believe that God is calling them to serve as missionaries abroad. The Rev. Adam Rick is engaging with students at Eastern University in a weekly bible study, two of whom will be confirmed in this church on Sunday afternoon. The Venerable Patrick Malone is assisting to train Deacon Lawrence McElrath who will serve as a chaplain in the United States Military [and there are many others]. As your Bishop, I firmly believe that educating and ‘unleashing’ the spiritual power, enthusiasm and entrepreneurial creativity of newly recruited and younger clergy is one of my highest priorities. As we consider our Lord’s commission to be ‘the light of the world’ I believe the Lord is calling us to be a diocese that Confronts And Transforms Injustice Through Serving Our Community And Nation (this is a third focus area of my vision for a Missionary Diocese). influenced global movements from the rise of democracy and the rule of law, to religious freedom, human rights, and the abolition of slavery. At this Synod we will hear from Church of the Good Shepherd in Binghamton, New York, Glory of God in Cocoa, Florida, St. Brendan’s in Tremont, Maine and Church of the Holy Spirit in Tulsa, Oklahoma who are fulfilling our Lord’s commission to be ‘the light of the world’ in very practical and effective ways. Many congregations and individuals across the Missionary Diocese of CANA East are serving as a voice for the voiceless, ministering to those in our prisons, visiting and caring for those who are lost and lonely, for refugees and immigrants. As your bishop, I invite each of the congregations and members of this wonderful Missionary Diocese to pray and plan to be the voice of Christ and the hands of Christ in our communities and across our nation. Pack food at your local community pantry, train as a hospice volunteer, serve at your local emergency-housing center. What does the Lord require of us but to do justice, and to love kindness, and to walk humbly with your God. Before I turn for a few moments to our Synod Scripture I want to acknowledge some faithful servants of Christ in our diocese. Almighty God has blessed CANA East with lay leaders and clergy who serve well above and beyond the call of duty, our Standing Committee, Diocesan Secretary, Canons Missioner, our six Regional Archdeacons and many others are just a few of the faithful whose ministry is The Missionary Diocese of CANA East. of the day between 5.30am – 6.00am has come from our Chancellor who has already been hard at work that morning on legal matters requiring his attention in our diocese. However, there have also been occasions when I have woken our chancellor for advice while travelling internationally in different time zones. Raymond, on behalf of this diocese we honor you Sir, and thank you for your invaluable advice and servants heart in the mission we share in this diocese. Earlier this year at a bishops meeting of the Anglican Church in North America, The Archbishop asked for a ‘show of hands’ from the bishops who might retire in 5 – 7 years. Out of the corner of my eye, I noticed the hand of Bishop David Bena begin to move heavenwards. In a response of astonishment from the opposite side of the room, I called out to our assisting bishop, “Put you hand down David Bena,” and if I recall correctly, Bishop Bena lowered his hand. My Executive Team, Canon-elect Neal Brown who serves faithfully as our Executive Canon, without any remuneration can only be described as a gift from heaven. Neal, may God be praised for your service to this Missionary diocese. Mr. William Reynolds our financial administrator and Miss Moriya French who serves as assistant to Brenda and me are genuine gifts from God who serve willingly and faithfully. Thank you for the gift of your partnership in the leadership of this wonderful diocese. My ministry as your bishop does not stand on its own. By now, most you have come to realize that my greatest gift is not preaching or teaching, leadership, raising money or speaking to media. My greatest gift is she, who for the past 24 years has preferred the background rather the foreground. Proverbs says, He who finds a wife finds a good thing and obtains favor from the Lord. My wife who loves me, prays for me, believes in me, corrects and forgives me, together with our family who are represented here today by our daughter Grace Elizabeth (of whom I am so proud) have helped shape me into the bishop that I am today. Brenda I love you. I thank God for you. I rejoice that in the remote West Coast of New Zealand’s South Island, the Lord brought you and me together in covenant love and marriage. I wonder if you believe it is possible for a nation or society to be changed and to be made more pleasing to God? We all know that by the grace and power of God, we ourselves have been changed and we know the power of the gospel to change individual people. But can society be changed? For a moment let us consider our nation. Our view of marriage and the family, our attitude to human life and its sanctity, including the unborn and the senile, the administration of justice, the education of our young people. Consider our treatment of the unemployed and of men, women and children who are trapped in the cycle of addiction, deprivation and poverty. Consider our nation’s record in human rights, ethnic minorities, stewardship of the natural environment. At the heart of every nation there lies an ideology, a set of values, meanings, inalienable rights. Here is the question for the Missionary Diocese of Cana East: Is it possible for the values and standards of Jesus Christ to prevail in North America so that our national culture is recognizably Christian? According to last month’s Pew Foundation entitled, “The Future of World Religions,” the religious profile of the world is rapidly changing. In the United States, Christians will decline from more than three-quarters of the population in 2010 to two-thirds in 2050. Judaism will no longer be the largest non-Christian religion. Muslims will be more numerous in the United States than people who identify as Jewish on the basis of religion. More globally, four out of every 10 Christians in the world will live in sub-Saharan Africa. I believe it is the will and purpose of Jesus Christ to transform society through his transformed people. Salt and light. These are the biblical images that our Lord Jesus himself chose in order to indicate the influence his followers are to exert in society. Not unlike many of the congregations in our diocese, the disciples of Jesus were small in number and yet, Jesus called them the light of the world, the salt of the earth, and the question is what did he mean? 1. Contrasting Communities (vs:13-16) Christians are radically different from non- Christians, in Matthew 5:13-16, there are two communities, the Christian and the non- Christian, the redeemed and the unredeemed, the regenerate and the unregenerate communities in radical contrast from each other. On one hand, there is the world with all its sin, evil and tragedy – – a dark place, and yet, on the other hand, there are disciples of Jesus Christ who are to be the dark world’s light. Christians and the world are set opposite each other and are as different as light from darkness. The world, which is rather like decaying fish or rotting meat because of its social decay, and Christians, who are to be decaying society’s salt. Almighty God is calling out a people for himself to be his own community, the new community, the Messianic community, the community of Jesus Christ and listen, the vocation of this new community, is to be holy. Jesus calls his new community to be salt and light to society, to be radically different. 2. Penetrating Pilgrims (vs.16) Christians are to penetrate non-Christian society. We are called by Christ to be morally and spiritually distinct. Both light and salt are both penetrating commodities. And yet, the great Christian tragedy is that so many disciples of Jesus Christ stay in our dark little dens and in our elegant ecclesiastical saltcellars, instead of getting rubbed into the community. Brothers and sisters, this is Christ’s call to us. Remember Jesus himself came into the world and that is where he sends us. 3. Influential Inhabitants (vs.16) Salt does not salt itself. It salts the environment in which it is placed. Light does not enlighten itself. It is given to light the community in which it is lit. Jesus said, “Let your light shine before others, so that they may see your good works.” Influential inhabitants. Both salt and light are effective commodities and they both change the environment in which they are placed. If you put salt in meat or fish, bacterial decay is hindered. If you switch on the light, darkness is dispelled. When we look at the prevailing trends in our nation we see social injustice, racial disadvantage, neglect of inner cities, the continuing evil of unemployment, violence on the streets, selfish covetous materialism, corruption in high places, the breakdown of marriage and the family, sexual promiscuity, the disregard for the sanctity of human life, the deliberate eradication of religious freedom. Who is to blame for the deterioration of standards in society? The media? The Administration? The agenda of theological and social revisionists? Well, yes, in part! Brothers and sisters of CANA East, if society is decaying, we the Christians are responsible! Brothers and sisters, it is hypocritical of us to raise our eyebrows and shrug our shoulders and wring our hands and blame the government. Jesus told us to be the salt and the light of society. If rottenness and darkness abound, we have to accept a measure of blame and with fresh determination be the salt and light our Lord is calling us to be. History is full of examples of societal transformation when people encounter the gospel in practical ways. The Rev. Georgette Forney (CANA deacon) is with us at this Synod representing Anglicans For Life. Through this remarkable ministry the unborn are being saved from cruel and barbaric extermination and life in North America is being preserved. CANA deacon The Rev. Bob Ragan leads Regeneration Ministries helping those caught in cycles of sexual or relational sin to find freedom. Mrs. Faith McDonnell from The Institute on Religion and Democracy is with us at this Synod. They seek to reform the Church’s role in public life, protect religious freedom, and support democracy at home and abroad. How do we go about being light in what sometimes appears as the ever increasing darkness of social and political change. God in his loving mercy has given us tools for the task. 1. We Pray: Christian prayer is different from every other kind of prayer because at the center of Christian prayer is Jesus Christ. The New Testament urges Christians to pray for the nations and their leaders, that we may lead a quiet and peaceable life in all godliness – – this is the will of God. 2. We Evangelize: Evangelism has an indispensable place in social action. Christian social action is impossible without socially active Christians, and socially active Christians emerge out of evangelism. It is when people are born again by the Spirit of God that He gives them a tender social conscience. We have a gospel to proclaim that will transform society. We pray. We evangelize. Brothers and sisters of the Missionary Diocese of CANA East, Jesus is still calling us to be the light of the world. American author Robert Bellah was the Elliott Professor Emeritus of Sociology at the University of California at Berkeley. He said: “We should not underestimate the significance of the small group of people who have a new vision… the quality of a culture may be changed when two percent of its people have a new vision”. Two percent of Branford, Connecticut. Consider the impact you can have on your church. Consider the impact Christians can have on their community. Consider the impact we can have on our nation. Consider the impact Christians can have in the world! Our concern as followers of Jesus Christ is neither with a religion called “Christianity,” a denomination called “Anglican,” nor with a culture called “Western,” but with a person, Jesus of Nazareth, the one and only God-man who lived a perfect life of love, died on the cross for our sins, bearing in his own person the condemnation that we deserve, was raised in triumph from the grave and is now alive, accessible and available to us through the Holy Spirit, the One who was and is and is to come! Missionary Diocese of CANA East, only in Him can we become the world’s salt and light, sharing the good news with others, making an impact on society, and above everything else, seeking to bring honor and glory to his wonderful Name. Amen!